This training guide offers physical practices (asana), breathing practices (pranayama) and meditation (dyhana) to improve mental, emotional and physical well-being. It also serves as a powerful resource for anyone trying to break free of negative behavioral patterns. Written by Prison Yoga Project founder James Fox, A Path for Healing and Recovery outlines practices that have been proven effective in helping prisoners to gain insight into unconscious patterns of thinking and compulsive behavior. The physical practice (asana), breathing (pranayama) and meditation (dyhana) practices that are featured in this book have also helped many behind bars to improve their overall quality of life – mentally, emotionally and physically. 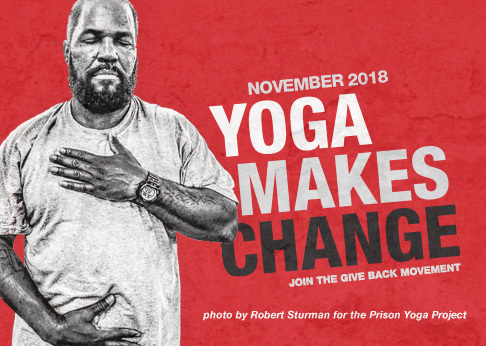 While this program has been developed through years of experience teaching yoga to incarcerated youth and adults, it focuses on the self-reflection and personal discipline necessary for one to lead a more conscious life, whether incarcerated or free. It is a powerful resource for anyone trying to break free of negative behavioral patterns. How you’re giving back: Purchase A Path for Healing and Recovery for a prisoner and gift it anonymously or designate that it be shipped to a prisoner you know. Or purchase a copy for yourself, and the proceeds will be used to support the work of the Prison Yoga Project.